Having just spent an unforgettable week in the Philippines, I will celebrate Easter this year in the sure belief that out of death comes life. Warmly welcomed by the Sisters of Mercy and local people in Bantayan Island. Sr Ailsa is wearing the orange hat; Sr Mary is to her left. ‘We have a faith that is 'Invincible Even In The Darkest Of Winter'… a faith that is both practical and emotional but realistic and faces reality without excuses… a faith that is honest and deep... it goes beyond sentimentality and pious devotions, but keeps us grounded amidst storms, and shines forth in the darkest of despair and desolation. We have a faith that is Creative… one that Moves us to Cope with Limits with humour, with style and elegance, with firmness. We have a faith that is fully Confident in a God who Saves and Protects… Even When Reality Seems To Prove Otherwise… a faith that survives its own doubts and anxieties – and proclaims its unbreakable Trust in a Saviour who Redeems. We have a faith that is Powerful in its Powerlessness… that waits patiently and without resentment, for Grace to work its Miracles and for God's Providence to do its work. One cannot but recall the words of Jesus, so appropriate to this Paschal Season: Unless a grain of wheat falls into the earth and dies, it remains alone; but if it dies, it bears much fruit. 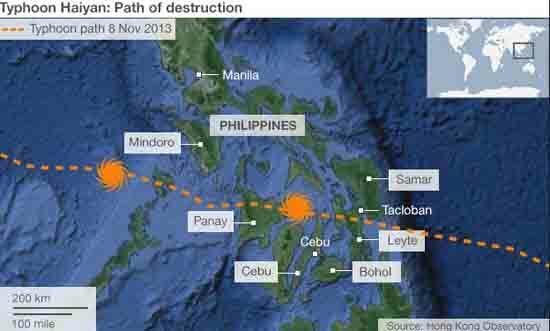 On November 8th, 2013, the super typhoon Haiyan, known in the Philippines as Yolanda and considered by some to be among the strongest such storms to make landfall, struck the Philippines. Its powerful winds and enormous storm surge smashed buildings, destroyed roads and caused widespread power and water outages. 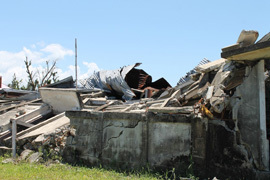 In particular, it wracked havoc in the Eastern Visayas region including the islands of Samar, Leyte, Northern Cebu, Bantayan Island, Panay and other neighbouring places. The government says that more than 6,000 people were reported dead. Many of the people say that for political reasons, the government has underestimated the figures and that the real figure is more likely to be over 10,000. Nearly 1,800 more are still missing and more than 27,000 people have been reported injured, according the country's National Disaster Risk Reduction and Management Council. The storm forced 3.9 million people from their homes. Almost 560,000 homes were totally destroyed and close on 600,000 more were damaged. The horrors of the disaster continue to be part of everyday conversation: the sea water being caught up, leaving the sea bed dry for 40 minutes; the three momentous waves that overran the land lifting big ships with it and crushing major buildings like match boxes; the thousands swept to their death; many bitten by the snakes that rose with the water; the stench of death that filled the air for weeks; the grieving, the loss, the heartbreak, but in spite of everything, the resilience. There are 88 Sisters of Mercy ministering in the Philippines and this gave an extra urgency to our response to the disaster. 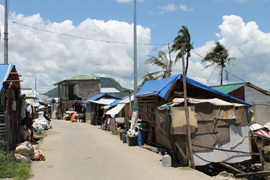 47 of the Sisters are members of the Tacloban autonomous congregation and the other 41 are members of the Sisters of Mercy (NyPPaW) – New York, Pennsylvania, Pacific West Community. Mercy International Association launched an appeal for the Philippine Mercy Support Fund. Donations poured in and to date this Fund has realised €804,000. 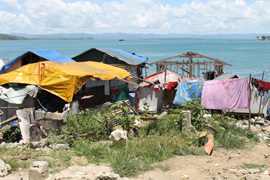 Tacloban City was one of the worst affected areas. Much of the city is still in a disastrous state. The airport is in shambles and the military planes continue to fly in supplies both for emergency and rebuilding needs. One can only imagine the years it will take for full restoration. 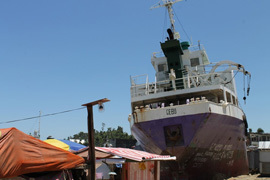 Many of the buildings are in a collapsed state; two ships lifted from the harbour are lodged in the middle of residential areas with, no doubt, several of the missing bodies trapped beneath them. The tall coconut trees are in tatters, though struggling to regrow their palms, most of the mango trees are uprooted, yet wherever a root is still connected to the soil, new shoots are beginning to sprout.